A little while back I wrote a blog about me finally spearfishing a Yellowfin Tuna off the back of a pod of dolphins. (Spearfishing a Lucky Yellowfin Tuna) Andrew Clarkson just pulled this off again!! Thought I would send you a pic of the yellow fin that I shot yesterday. Clocked in at 35Kg, also off the back of a big dolphin pod. Super stoked as I missed out on one in December but managed to nail this one - my biggest fish to date. Was an awesome experience! Anyway well done to Andrew great fish, hope the sushi was epic too. 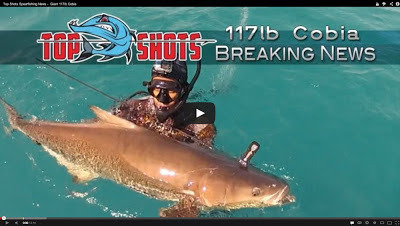 Today the Top Shots Channel launched their first revolutionary spearfishing news video. This unique concept features any news worthy spearfishing video footage. This way guys get their great achievements and moments 'aired'. It is aslo good to hear what you guys think ... so post a comment and let me know what you think of this video.